Guts. 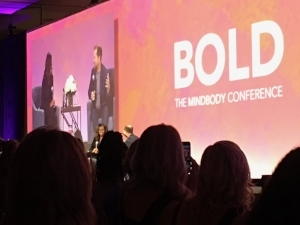 Guts is the one word that Former First Lady Michelle Obama and athletic icon and equality activist Billie Jean King each spoke within moments of addressing the crowd at the BOLD Mindbody Conference I attended in San Diego last week. Their keynote addresses were independent, on different days and on different topics. Yet guts opened both of their conversations with the audience and set the tone for the dialogue to follow. Michelle, as she asked us all to call her, named guts, passion and stamina as the three key traits she saw within the audience which was filled with yoga studio owners and fitness and wellness professionals. She challenged us to strip down to the real essence of self instead of presenting an easier, more polished social media persona. She asked us to allow people, especially strangers, to really see who we are so they can understand the full context for our decisions, opinions, and life choices. From a full 360 degree circular viewpoint, we allow a full, vivid picture to come into focus. 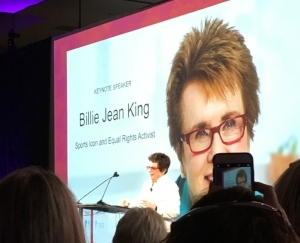 Billie Jean King empowered us to use our guts - to act on our values, to stand up for equal rights and for ourselves, and to differentiate right from wrong and to fearlessly touch inspiration at the deepest level. The second common theme within both keynotes was perfection. Michelle jokingly reminded us that while we all strive for perfection, no one actually likes it when we are anyway! What a great reminder in an age of social media, where every smartphone user is a photographer and every selfie-taker a model. Only from exposing our authentic selves can the the true context of our lives reveal itself. Seeking to understand a person’s background, worldview and personal story of experiences helps us see the “why” behind opinions and choices. Seeing context can begin, if not to heal division, then at least to understand from where the divide stems. Striving for perfection as seen in someone else’s eye, Billie Jean King pointed out, can lead to depression, self loathing, and inhibit your ability for greatness in the world. We should never let lack of perfection hold us back or scare us from presenting ourselves to the world and participating fully in everything we do, right down to the gut-level. I was moved by her down-to-earth nature, conversational tone, and honesty. My spirit filled with joy being in the same room with her becasue she was so joyful herself. It was contagious and I was grateful for the inspirational spirit boost! I’ve seen a lot a amazing speakers and teachers, from His Holiness the Dali Lama, to Deepak Chopra, to Eckhart Tolle and more. Billie Jean King was my favorite by far. I encourage everyone to seek out the masters, the teachers and the leaders whenever the opportunity arises, even if it seems inconvenient at the time. Attending this conference was a logistical nightmare. Barely 48 hours earlier I was in Athens, Greece, a 10 hour time zone and 17 hour flight away. But something in my gut told me to be at this conference and get into the same room with these women and hear what they had to say. You can be inspired daily if you just pay attention. That’s why I do yoga. That’s why I meditate. That’s even why I travel, and why, after almost 2 decades, I’m still inspired to teach the Eastern Healing Arts. These practices force me to pay attention to myself, to the world and to my students. And the inspiration is endless.